Today is March 1st and unfortunately Black History Month 2017 is behind us. The good news is that we made it through our first whole month with Donald Trump as President and some horrible fate has yet to befall all of us. We had some good moments this month — but we also took some Ls. Here is a recap of some of the best wins and worst losses black people had in February. 1. To begin celebrating Black History Month, VP Mike Pence (or his social media team) sent out a tweet to an important figure of Black History: Abraham Lincoln. That’s right, because in his mind, black people couldn’t do much of anything before the 13th Amendment of the US Constitution. We had no significant historical contributions until this white man set us free. None whatsoever. No inventions, no enlightened thought. So thank you, President Lincoln, for making Black History Month possible. 2. Moonlight won Best Picture at the Oscars, beating out the majority-white cast for La La Land. However, due to the controversial mistake in announcing the winner, most people won’t remember Moonlight winning — they’ll remember La La Land losing. Jimmy Kimmel makes jokes about ethnic sounding names like a New England frat boy at a small liberal arts college. "Patrick, that's a name!" Because "white" names are real names. He can get all the way out of here with that casual racism. You receive the greatest honor of your career and immediately after a white man reminds you that you are different. What fuckery. how many jokes did jimmy kimmel make about mahershala ali's name right after making a joke about how racist trump is? did anyone keep count? 4. Education Secretary Betsy DeVos tried to use the inception of HBCUs as an example of how school choice can be beneficial in underserved communities. Unfortunately she failed to mention or even realize that HBCUs were created because black people were barred from attending white universities, public or private. This woman is in charge of educating black children in America. Awesome. 5. Newly appointed Attorney General, Jefferson Beauregard Sessions, admitted that he had not read the Obama Justice Department’s scathing reports on civil rights abuses by police departments in Ferguson and Chicago. Yet the very next day he announced that the Justice Department would be “pulling back” from investigating police departments for civil rights abuses. 6. In one of the biggest choke jobs in Super Bowl history (or sports history for that matter) the Atlanta Falcons blew a 25-point lead on the New England Patriots and allowed them to score 31 unanswered points in 18 minutes to win the game. This was a literal loss for Falcons fans but many black people felt like we took an L as well. This is because superstar quarterback Tom Brady, Head Coach Bill Belichick, and team owner Robert Kraft are ardent Trump supporters. Plot twist: six players on the Patriots said they would boycott going to the White House to be congratulated by President Trump. 1. Mahershala Ali becomes the first Muslim-American actor to ever win an Oscar. Mahersha Ali wins #Oscars for best supporting actor. First Muslim to ever win an Oscar! 2. Viola Davis becomes the 10th person all time to win an Oscar and a Tony in the same year. She is only woman to have won an Oscar, an Emmy, a Tony, a Golden Globe, a SAG, and a BAFTA award. 3. 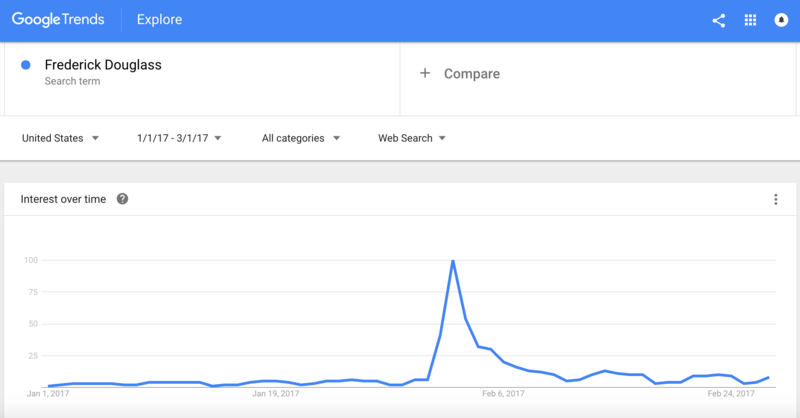 Our President likely doesn’t know who Frederick Douglass is, but ever since his gaff of a speech to “honor” Black History Month, Google searches related to Frederick Douglass have increased by 300 percent this past month alone. I suppose he is being recognized “more and more every day” despite biting the dust more than a century ago. 4. Yale University decided to rename one of its buildings on campus that was named for former South Carolina Senator and Vice President of the United States, John Calhoun. Calhoun was a strident white supremacist and led the pro-slavery faction of the U.S. Senate. Yale came to this decision after years of student protests. 5. In a win for the civil liberties of not just blacks, but all Americans, a Manhattan Supreme Court Justice ruled that the NYPD must disclose video and documents pertaining to the surveillance of Black Lives Matter protesters in Grand Central Terminal during 2014 and 2015. 6. Comedian and Director Jordan Peele’s debut racial horror thiller Get Out celebrated its opening weekend as the #1 movie in the country after scoring a very rare 100 on Rotten Tomatoes. It received $33.4 million at the box office knocking out Lego Batman for the top spot. 7. A racist couple who terrorized a black child’s birthday party in Georgia by waving confederate flags, yelling racial slurs, and pointing a shotgun at party-goers and threatening to shoot them, have been sentenced to substantial prison sentences. Jose “Joe” Torres, was sentenced to 20 years after being convicted on three counts of aggravated assault, one count of making terroristic threats and one count of violating of Georgia’s Street Gang Terrorism and Prevention Act. Kayla Norton was sentenced to 15 years after being convicted on one count of making terroristic threats and one count of violation of the Street Gang Act. Oh, they’ve also been banished, BANISHED, from the county where all that took place. We should really bring back banishment in a more dedicated way.